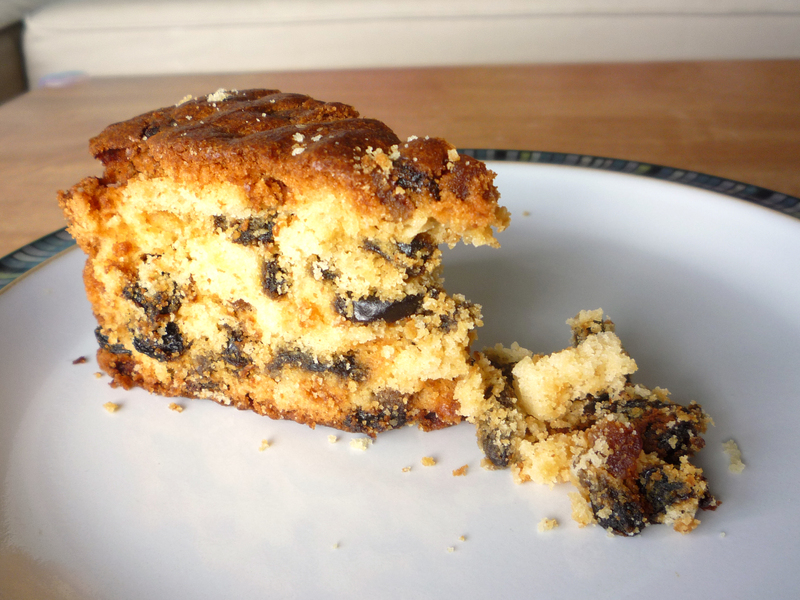 This is another recipe that came from my mum and has been made loads of times by both of us over the years. It’s just so quick and easy, and tastes yummy! 1. 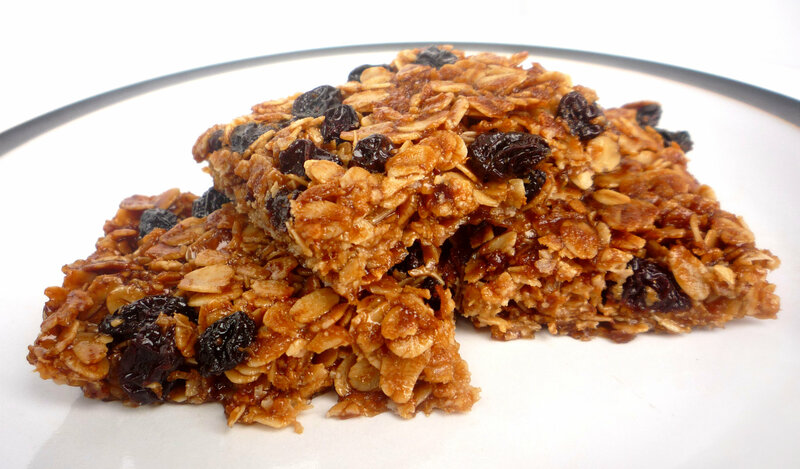 Mix oats and sugar (and raisins, if using) in a bowl. 2. Melt butter and syrup together in a saucepan. 3. Stir the dry ingredients into the butter and syrup mixture. 4. Press into a lined baking tray (mine is 27x19cm, which makes the flapjack come out fairly thin so a smaller tray would also work fine). 5. Bake at 175ºC for approximately 25 minutes, until golden brown. As you can see from the photo, mine came out quite dark because it was a little overcooked (I do love my tabletop oven but it’s very difficult to judge cooking times with it!) so maybe check it a bit earlier to see how it’s doing. Last time I undercooked it and it was very crumbly, so that’s a risk as well! 6. Allow to cool a little and then cut into squares (if you leave it too long, it will be too hard to cut easily – I have done this many, many times!). P.S. Click here or on the recipes tab at the top of the page to see my other favourite recipes! I have to admit that I’m not a huge fan of the really rich fruit cakes that you get at weddings and Christmas (but don’t get me wrong, if given some I will eat it!) 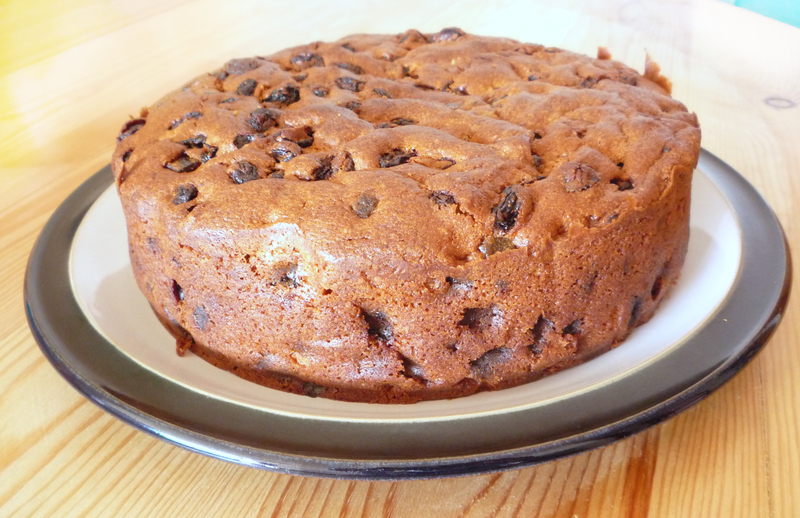 but I have a recipe for a fruit cake that is much lighter and, in my humble opinion, tastes great. As you can see, it comes out a bit crumbly! But it is definitely not dry. 6. When it looks done on top, stick a skewer or a knife in. It should come out clean if the cake is ready. So there you go, I told you it was easy. 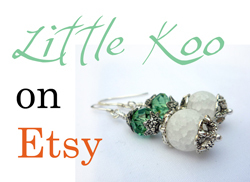 Let me know if you give it a go! We’ve made this recipe many times (I have to admit he is usually the one who makes it, not me) and it’s always a winner. It’s actually much easier to make than you’d think, you don’t even need an oven. Plus, it’s a great way to impress people when you have them round for dinner! I’ve not met anyone who doesn’t like it yet. 1. Break up the biscuits into crumbs and combine with the melted butter. Press into the bottom of a round tin to make the base of the cheesecake (our tin is 8″ diameter). 2. Separately, beat the Philadelphia and sugar together until smooth. 3. Stir in the gelatine solution and melted chocolate until smooth. 4. Fold in the cream and 150g of the raspberries. 5. Pour this filling onto your biscuit base and refrigerate. 6. 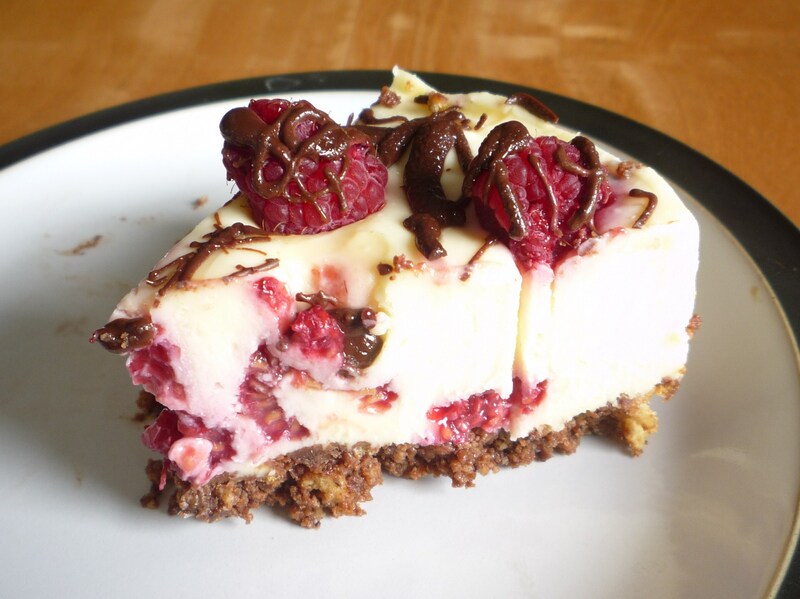 Once the cheesecake has set, decorate with the remainder of the raspberries and drizzle the melted dark chocolate over the top. Return to the fridge until the chocolate has hardened. Cheesecakes are so easy to make (we also have a recipe for a chocolate and Baileys cheesecake!) and they taste sooooo good. I hope you’ll have a go at this one. If you do, please let me know how you get on! Anyway, my sister in law made some and we saw her eating it when we were skyping recently. I commented on how much I love it and she sent me a link to the recipe. I was a bit apprehensive about making the toffee layer in particular but I just followed the recipe really carefully and I was really pleased with how it turned out, so I’ll definitely be making it again! I just followed this recipe from BBC Good Food, but only made half the amount of caramel that the recipe says. I think it works nicely this way. Let me know if you have a go at this yourself and how it turns out! My only tip is to use proper butter – I used a cooking spread the first time and it just doesn’t taste as good! 1. Soften the butter and mix the ingredients together. I think I remember hearing on the Great British Bakeoff that you mustn’t let it get too warm so use your fingertips for this! 2. Roll the mixture into a sausage (I normally make my sausage 4-5 cm in diameter) and cut into discs 1 cm thick or less. The discs will spread in the oven and come out bigger so it’s worth bearing this in mind when you are choosing how big to make them. 3. Place the discs on a baking tray and dust the tops with caster sugar. 4. Bake at 180°C for 18-20 minutes or until golden brown. Let me know if you try this recipe out and what you think! 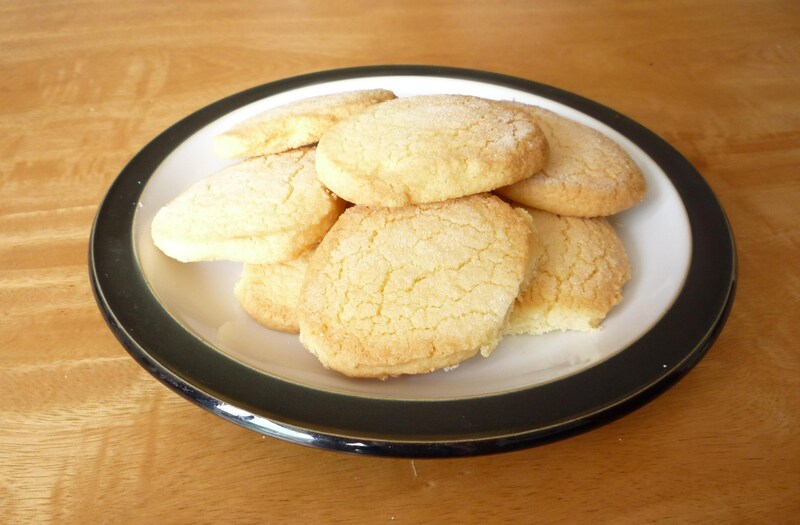 I always get lots of compliments when I make this shortbread! 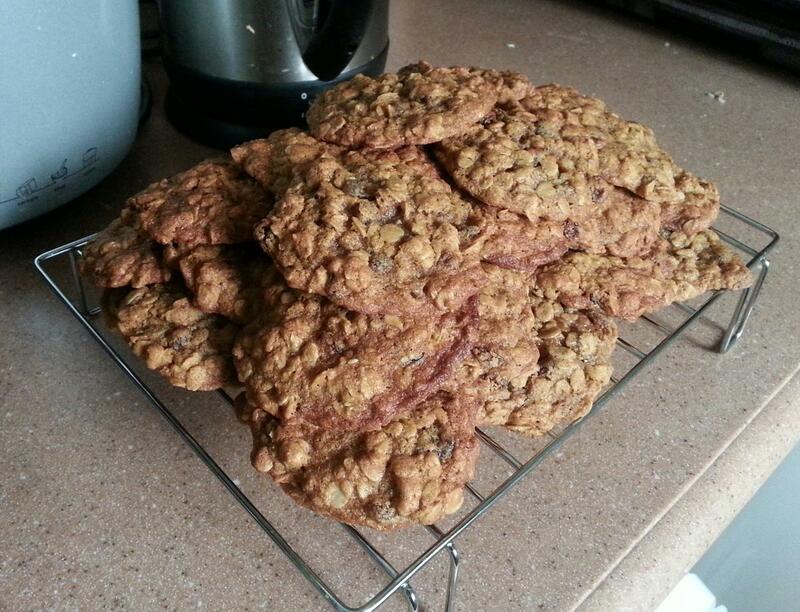 This oatmeal and raisin cookie recipe is a new favourite recipe of mine. I’ve only just baked it but I like the cookies so much that I just had to share it with you! I made 35 large cookies, but I guess how many you make will depend on how big your rounded tablespoons of raw mixture are. Do let me know if you have a go at this recipe and how they turned out. I think they taste even better than they look! 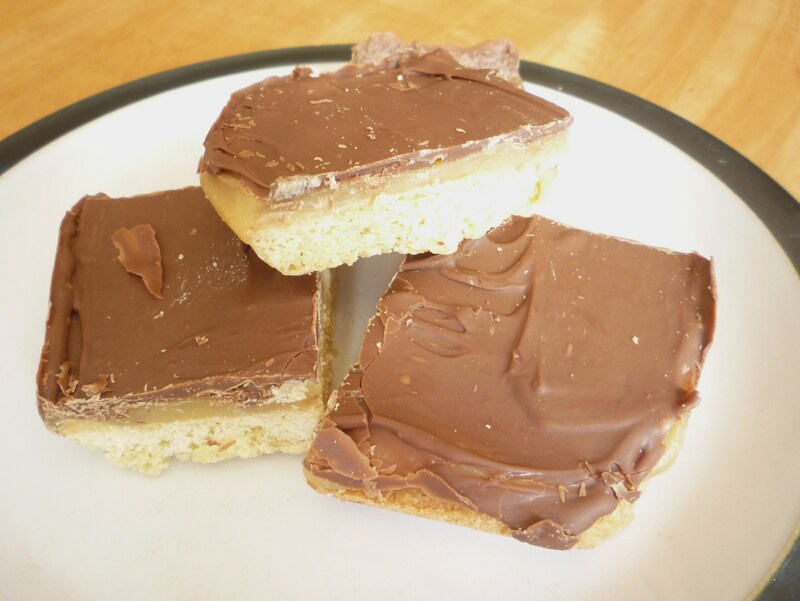 Being very heavily pregnant at the moment means I don’t really have much energy for baking things right now but I thought I’d share a recipe that I came across on another blog. Whenever I bake this I get lots of compliments and people asking for the recipe so it must be good! The recipe is for chocolate crinkle cookies, which come out nice and chewy and very chocolatey! You can find the recipe here.